Thanx God it's January and Melodifestivalen participants have started to make some nice music gifts to please fans and prepare them for a new schlager-season and today we get exclusive free track from Le Kid! 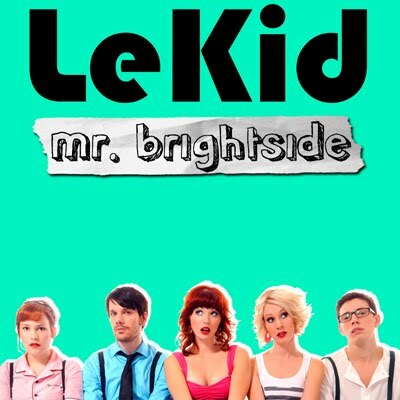 Few month ago band has presented their live-cover of Killers' "Mr Brightside" turning to be nice small piano based version and now track is ready in studio-quality and instead of puting it on sale Le Kid generously provides free download of the song on their site and final version sounds completely awesome! It's a powerful electro-pop track with stylish synth-arrangement of verses and blasting schlager-tune of chorus with that pop-impression and catchyness we've fallen for listening to Le Kid first time around two years ago. 5th of February is the day when Le Kid will perform their song "Oh My God" at Melodifestivalen, bids are high on their winning so maybe next time you'll see this cover in album of future Melodifestivalen winner.